Register up to 9 people in one transaction. Come join us for the 4th Annual Run of the Harvest Hustle 5K as we kick off the annual family fun activities of "Countryfest" in Lindale, Texas. Proceeds benefit one of four charities to your liking. Register early, fee raises to $35 on race day. T-Shirts are guaranteed to anyone registering by October 1, 2017. T-Shirt on race day will be on a first-come, first-serve basis and may not be available in all sizes. This is a Certified 5K Course. The Harvest Hustle will begin in the heart of Lindale on Industrial Street, adjacent to the Lindale "Pickers Pavilion." 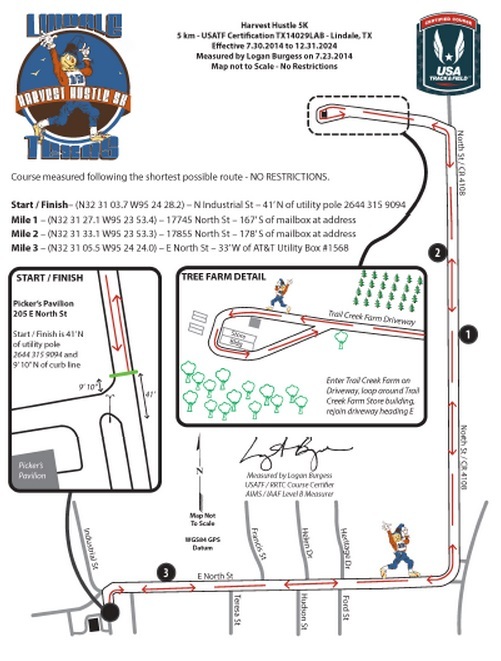 Runners will "get their legs under them" on the flat first half mile traveling through a residential area east on North Street, then turn north onto the challenging rural rolling hills of Iron Mountain Road! At the "half way" point, runners will enter the beautiful Trail Creek Farm (our local Christmas tree farm) and will travel into the farm, around the barn, out the gate and back onto Iron Mountain Road. The back stretch for runners will again be the rolling hills of Iron Mountain Road, to the west turn onto North Street for the half mile dash to the finish! Stay after the race for all of the activities of "Countryfest" in Lindale! A great family friendly event!! When this page loaded, the official time was 12:47:53 PM EDT.